Trapped was born "in my list of must do paintings" when leaving New York City through the Holland Tunnel a couple years ago. My husband was driving and I was delighted by the reflections of lights in the ceiling and walls of the tunnel. Now you might be wondering, if this was a happy moment enjoying the lights, then why is the titled Trapped? Well, although the initial moment when entering the tunnel was a happy one, my reaction once I get inside tunnels that are under bodies of water is angst. I really dislike tunnels under water. Maybe there have been too many movies about water flooding these kinds of tunnels that works on me. Generally in the movies this occurs after some bad guy sets off an explosive (not a natural disaster), but none the less these movies have gotten into my psyche. 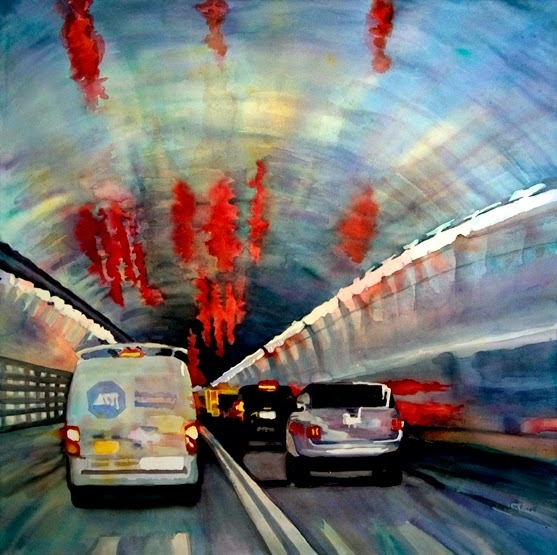 When invited by the Columbia Art Center to participate in an exhibit titled "Things that Scare Me" I thought of the pictures I had taken and decided it was time to do my Holland Tunnel painting. Part of me says I shouldn't call this painting Trapped since it was the beauty of the reflections that really made me want to paint this. While getting ready to paint this I decided to emphasize the dark "hole" at the end of the tunnel, but wanted to contrast it with the beautiful subtle colors in the concrete and tunnel walls. 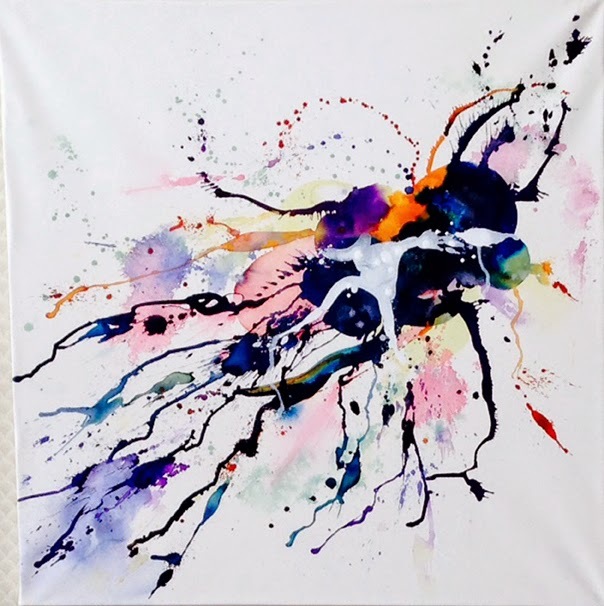 The calming colors surrounding the dark hole make me smile when I look at the painting. Maybe this painting will end up being therapeutic and help me get over this phobia. The people in Guatemala have wonderful traditions surround All Saints Day. It is a day to celebrate their family members who have passed. They flood into their cemeteries and spend the day together with family living and dead. The fly kites with messages for those passed tied to the tails. Flowers are everywhere. Streets are decorated with beautiful floral "paintings". This woman is carrying a bundle of flowers on her head as she heads into a cemetery. The women in the background are selling flowers. I was lucky enough to be in Antigua, Guatemala over All Saints Day to see these traditions. 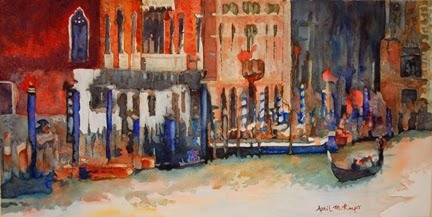 Some traditions I have captured in paintings are others will certainly make their way into paintings over time. 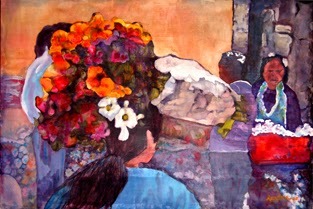 My painting Messengers is another painting about these traditions. Since I generally paint semi-abstract or realistic scenes of people and places, when I venture out in new directions I can't help but see things in my non-objective work. I think it's a bit like looking at clouds and seeing people or animals. Or maybe something like when people from long ago gazed at star formation and found pictures that became named constellations. I don't know if humans have some reason that causes them to look for the familiar? I find it fascinating how when shown random objects we seem to want to make some kind of order to them. Even the Rorschach psychological test created by Swiss psychologist Hermann Rorschach used ink blots to try to evaluate people's thinking processes. I won't share what I see in my own painting so as not to bias your experience, but it would be interesting to me to hear what if anything you see in Intertwined. Enjoy! I hope this painting brings you as much joy as I had creating it. So you've seen several of my paintings looking down on city streets so now it's time to take some time and enjoy the beautiful scenes above our heads. Almost 18 months ago I was headed to one of the local art centers and happened to park on the street. While walking up the hill toward the center I happened to look up. It was a gorgeous fall day, the leaves had changed and I happened to have my camera with me. Since the stars had aligned I took a photograph, as I am likely to do when I see something that catches my eye. 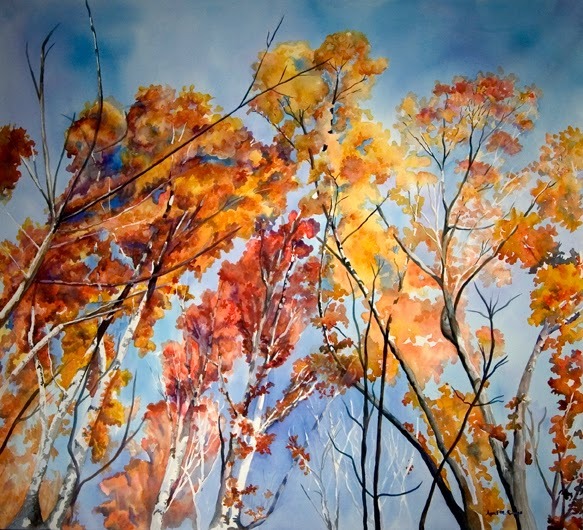 I had decided I wanted this to be a large painting to help convey my feeling when I saw the trees. They were this magnificent stand above my head saying hello as they swayed in the breeze. So hello from the trees; I hope they make you smile too.